Why do people have to beg for safer roads? 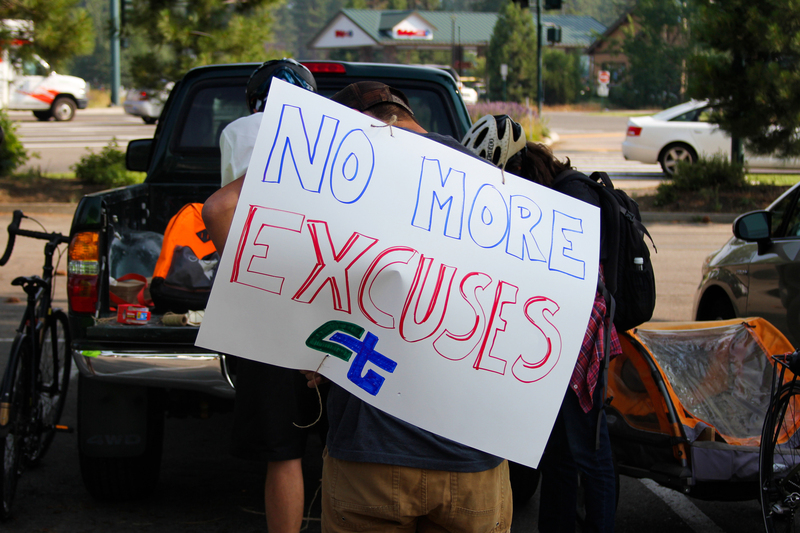 Last week, residents of South Lake Tahoe staged a small demonstration on Highway 50—which doubles as the town’s Main Street—to call attention to the lack of safe crossings on the busy highway. The demonstration— about a dozen bicyclists, closely followed by police in SUVs—was inspired by the recent hit-and-run death of a bike rider along this stretch of road. It was also inspired by frustration. Community Mobility Group, which advocates for better infrastructure for people walking and biking, has been asking Caltrans to create a safer way to cross the highway at the spot where Trevor Bright was killed since 2015. They say now is the perfect time to fix the problem, while the highway is undergoing construction along this stretch. But Caltrans District 3, through its public information officer Steve Nelson, told the Tahoe Daily Tribune that it was not possible to change the ongoing project, and that further study of how many people walk there would have to be completed before any fix could be made. “In order to place a crosswalk on a state highway, the pedestrian volume needs to be high enough to justify it,” Nelson told the Tribune. If pedestrian volume along a stretch of Main Street isn’t high enough to warrant a crossing, isn’t that in part because the road is designed to discourage people from walking? But people do walk, and sometimes have to cross a street, even when it’s a highway. Expecting them to walk a long way out of their way to reach a signal is one of the ways current road design tells people that walking is just not right. This despite research telling us we should all be walking more for our own health and well-being—and despite Caltrans’ own goals to encourage more walking trips. It’s possible that one cyclist’s death is not enough to put this particular place on Caltrans headquarters’ map of pedestrian hot spots. And that map is just a pilot project at this point, anyway, and it needs lots more work. But if local residents know there is a problem—and have been telling Caltrans there is a problem for years—Caltrans ought to listen. And local district staff could also listen to state headquarters staff, who have been gathering and disseminating resources to solve just this kind of problem. The current construction project is actually a water quality project, said Gavin Feiger of Community Mobility Group, one of the advocates that has been meeting with Caltrans to find a solution. Urban runoff is a major contributor to pollution in Lake Tahoe, and this project, which has been in the planning stages for fifteen or so years, will add curbs and gutters, as well as a catchment basin for water before it reaches the lake. Sidewalks and bike lanes will also be added. It will be built in three phases, over three summers, during Tahoe’s construction window between April and October, when there is not likely to be any snow on the ground. This summer, the second phase, will see the completion of the section of road where Trevor Bright was killed on his bike, and where Community Mobility Group has been asking for a safer crossing. Feiger says that the finished project will definitely be an improvement over what’s there now. “But in the end, it’s still a five-lane forty-mile-an-hour highway that serves as Main Street,” he said. Caltrans, he said, has implied that “we’re lucky they’re putting in bike lanes and sidewalks,” and has refused to make further changes to the project. And because construction is currently disrupting the area, a pedestrian count to find out whether a crossing is “justified” can’t be conducted until next summer at the earliest. Community Mobility Group says that is too long to wait. “Someone actually died there, and they are just like ‘whatever’,” said Feiger. Nelson told the South Lake Tahoe Tribune that “this is a mid-block location of a five-lane highway with shoulders, which would be a very long crosswalk without traffic control.” But Community Mobility Group is asking for a crosswalk, lighting, and a pedestrian median, which would shorten the distance for pedestrians. All these safety suggestions came from a recent Road Safety Assessment that Caltrans and the Federal Highway Administration conducted in the area [PDF]. Feiger said their request for lighting in the area— “there are no lights on that section of road,” he said, “and it’s very dark” —was met with indifference. “Their excuse was that it would encourage people to cross there if there was lighting,” he said. Nelson told Streetsblog that two new signals nearby will create “safe options for bicyclists and pedestrians to get across Highway 50 in this area.” Perhaps. But one of those options—at Lodi Avenue—is on the other side of the river, and the other is a long walk from two places people want to walk to and from: a Motel 6 and a Grocery Outlet. Nelson also said that Caltrans has yet to see the CHP report on the bicyclist fatality—and presumably, therefore, cannot come to any conclusions about how Bright’s death could have been avoided. Instead of prioritizing people’s safety, Caltrans is playing it safe and sticking to its old rulebook: be cautious not to jump to conclusions, don’t disrupt ongoing construction projects, and never do anything to disrupt the flow of vehicle traffic. Caltrans headquarters may be working to shift the agency’s approach to pedestrian and bicyclist safety, but that new perspective clearly hasn’t trickled down to this local district yet. Personally, I really like the refuge islands, bulbs and narrowed streets, even much more than the beacons. 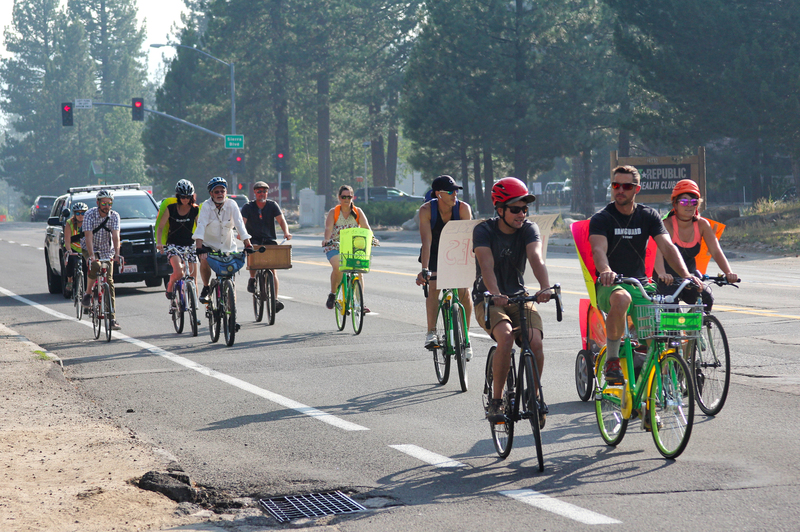 There are pedestrian/bike improvements in north Tahoe (which has fewer through streets), especially in Tahoe City… it seems they could do the same thing in South Lake Tahoe. Highway 101 bypasses Healdsburg and it’s thriving. Cloverdale has always had issues. It’s the armpit of Sonoma County, or so my friend who grew up in that area tells me. In any event, it’s certainly not an apt comparison with a destination resort area like SLT. so you want to route it through a residential area instead? And if you think bypassing the retail area with a billion dollar bypass project is a good idea, please visit the dying commercial center of Cloverdale. South Lake Tahoe’s businesses rely on those casino customers and skiiers stopping. How exactly do you expect things to work when Pioneer intersects 50, after several blocks in a residential area with narrow streets? It’s already very backed up with people who know the back route, let alone making it the official route. This is the line given to municipalities all across the country when they have to beg for crosswalks from their DOTs. It’s not exactly correct according to FHWA. The MUTCD requires no minimum pedestrian volumes for crosswalks. If the community just wanted to install a pedestrian refuge island, crosswalk and flashing beacons (the bare minimum IMO), a warrant study shouldn’t be required. Through traffic on Highway 50 should be rerouted along Pioneer Trail so that Lake Tahoe Blvd. would carry mostly local traffic. This first report focuses on Caltrans District 4, which covers the greater Bay Area. It sets out to begin a discussion about what sea level rise and rising temperatures might mean for state highways.